The National Autistic Society describes Autism as ‘a lifelong developmental disability that affects how people perceive the world and interact with others.’ If you have autism, you may sometimes struggle to form friendships, read social situations or behave in a way your colleagues expect you to. You may also need extra support organising, sequencing and prioritising tasks at work. There’s lots of resources out there that can help you form relationships in the workplace or manage your workload, but for Autistic Pride Day I want to share some of my personal tips for thriving in the workplace as a person on the autistic spectrum. I have had a lot of successes at work, so I must be doing something right! 1. My first and most important tip is – let your employer know you are autistic or on the autistic spectrum. While you may be worried about workplace discrimination and may be tempted to hide your disability to ‘fit in’, there are many employers are happy to make reasonable adjustments for you and they will be able to make a much fairer assessment of your abilities if they’re aware of your strengths and weaknesses. Your performance at work will also improve. 2. Have a chat with your colleagues about your autism to make them aware of your strengths and weaknesses. When a new colleague joins my team I sit them down for a tea or coffee and let them know that I will be able to complete tasks faster if they format their emails in bullet points and give me all the information I may need from the start. I also send them a short email with my communication requirements to help them remember my specific needs. If holding or arranging 1:1 meetings is not one of your strengths, filling out an Autism Passport to give to your colleague may also help. 3. Maintaining eye contact is interpreted as a sign that you are focused and paying attention. This is why when a person with autism may not look someone in the eye because it may cause them sensory overload or anxiety, the other person may interpret it as a lack of confidence or apathy. If you want to show you are paying attention but don’t want to overload your senses or heighten your anxiety, look at their nose. The nose is right between the eyes so the other person won’t be able to tell you are focusing on it. 4. While non-autistic people may be able to instinctively pick up on social cues, some autistic people need to be taught or teach themselves what these social cues mean. If you’re unclear about a social situation at work or don’t understand what’s expected of you – ask for clarification or repeat back what the other person has said to make sure you have understood what’s being said or what is asked of you. If your colleague knows about your disability, they’ll be understanding and adjust their communication patterns. It also creates a good impression because it shows you’re being proactive about communicating with your team. 5. Pay attention to how other colleagues behave in certain social situations. For example, shadowing a colleague during a client meeting can help you understand what kind of behaviour is expected without putting pressure on you to perform and then you can ask your colleague questions afterwards. 6. Sometimes you may want to keep certain things about your personal life private at work or you may know about sensitive information, but you have trouble deciding what you should or should not tell your colleagues. You may also have trouble deciding what information you can or can’t keep from clients for data protection or confidentiality purposes. I’ve always kept a mental list of things that are okay to tell clients and colleagues – but if you need a visual tool you can copy Sheldon’s zones of privacy diagram. In the Big Bang Theory television series, when Sheldon shared private information about him and his girlfriend Amy that he was not meant to disclose to his friends, he created the zones of privacy diagram to help himself understand what information he could share with who to repair his relationship with Amy. 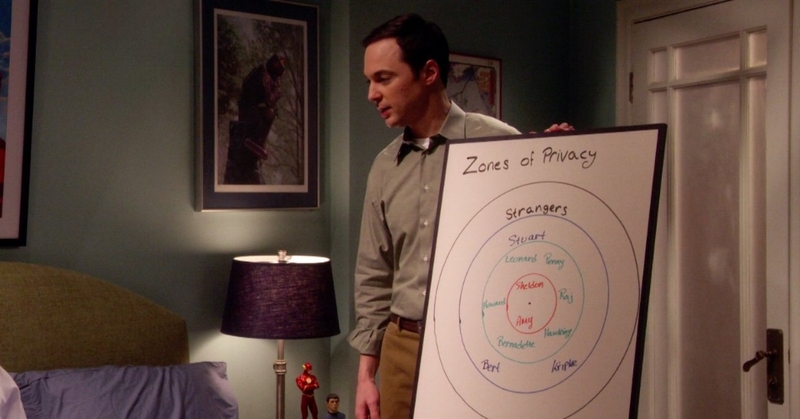 Sheldon holding up his 'privacy zone' diagram and showing it to Amy. 7. There are times where you may say ‘no’ to a colleague when they ask you to add another task to your workload even though they may be offended, or you may say ‘yes’ because you don’t want to upset your colleague, even if it means your performance may be affected. Instead of saying ‘no’ or agreeing to do something for a colleague straight away, discuss your list of priorities with them and figure out if the task is something you can fit into your work schedule without impacting your other tasks. This will help you balance your workload while sustaining a work relationship because your colleague will appreciate that you’re balancing your needs with theirs. 8. You have fantastic ideas – but sometimes you are unable to express them ‘in the moment’ or feel shy about expressing them. If this happens, write down your idea or what you want to say on a piece of paper or notebook. Then read it and reword it until you think that it expresses your ideas clearly. If possible share that idea with a colleague you trust who will provide constructive feedback, then try to memorise the information. If you can’t memorise it, keep the piece of paper with you and lay it down on the table in front of you. 9. Executive function is a set of mental skills that help a person manage time, remember details, switch focus, plan and organise. Some people with autism or learning disabilities may struggle to develop these skills and need to practice coping strategies to organise their time and complete tasks. While my employer and I think my organisation skills are really great – sometimes I can feel stressed out if I feel like I have a very busy schedule. To manage my stress I take a step-by-step approach: I make a list of what I have to do, map out the steps I need to take to complete each task, make a note of how much time it will take and set a deadline for it. This helps me to feel like I am in control because I feel a sense of accomplishment every time I complete a step and it helps me figure out what to do next if something disrupts my plans. Michelle has created a to-do list board using sticky notes. Michelle's line manager Barbara is looking at the notes as Michelle explains what her priorities are for the next month. 10. Technology can be your best friend when developing coping strategies for executive dysfunction. Do you struggle to plan your day or allocating time to tasks? You can create a schedule on Google calendar or Outlook to remind you how much time you should spend on each task. Do you need to write down the steps to complete a task? You can use Trello, the project management app, to create a checklist that can help you track your progress. If you forget how to do certain tasks, you could ask your employer if purchasing How Do I? stickers can be a reasonable adjustment. Tomorrow my colleague Mel will be releasing an Access to Work blog that will guide you through the process of requesting them, so please keep an eye on our social media accounts for more details. Did you enjoy my top tips? Please let us know in the comments section or on social media.